Richard Phillips Feynman (/ËfaÉªnmÉn/; May 11, 1918 â" February 15, 1988) was an American theoretical physicist known for his work in the path integral formulation of quantum mechanics, the theory of quantum electrodynamics, and the physics of the superfluidity of supercooled liquid helium, as well as in particle physics (he proposed the parton model). For his contributions to the development of quantum electrodynamics, Feynman, jointly with Julian Schwinger and Sin-Itiro Tomonaga, received the Nobel Prize in Physics in 1965. He developed a widely used pictorial representation scheme for the mathematical expressions governing the behavior of subatomic particles, which later became known as Feynman diagrams. During his lifetime, Feynman became one of the best-known scientists in the world. In a 1999 poll of 130 leading physicists worldwide by the British journal Physics World he was ranked as one of the ten greatest physicists of all time. He assisted in the development of the atomic bomb during World War II and became known to a wide public in the 1980s as a member of the Rogers Commission, the panel that investigated the Space Shuttle Challenger disaster. In addition to his work in theoretical physics, Feynman has been credited with pioneering the field of quantum computing, and introducing the concept of nanotechnology. He held the Richard Chace Tolman professorship in theoretical physics at the California Institute of Technology. Feynman was a keen popularizer of physics through both books and lectures, notably a 1959 talk on top-down nanotechnology called There's Plenty of Room at the Bottom, and the three-volume publication of his undergraduate lectures, The Feynman Lectures on Physics. Feynman also became known through his semi-autobiographical books Surely You're Joking, Mr. Feynman! and What Do You Care What Other People Think? and books written about him, such as Tuva or Bust!. Richard Phillips Feynman was born on May 11, 1918, in Queens, New York City, the son of Lucille (nÃ©e Phillips), a homemaker, and Melville Arthur Feynman, a sales manager. His family originated from Russia and Poland; both of his parents were Ashkenazi Jews. They were not religious, and by his youth Feynman described himself as an "avowed atheist". he also stated "To select, for approbation the peculiar elements that come from some supposedly Jewish heredity is to open the door to all kinds of nonsense on racial theory," and adding "... at thirteen I was not only converted to other religious views, but I also stopped believing that the Jewish people are in any way 'the chosen people'." Later in his life, during a visit to the Jewish Theological Seminary, he remarked that he found the Talmud as a "wonderful book" and "valuable". Feynman was a late talker, and by his third birthday had yet to utter a single word. He would retain a Bronx accent as an adult. That accent was thick enough to be perceived as an affectation or exaggeration â" so much so that his good friends Wolfgang Pauli and Hans Bethe would one day comment that Feynman spoke like a "bum". 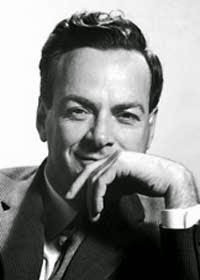 Upon starting high school, Feynman was quickly promoted into a higher math class and an unspecified school-administered IQ test estimated his IQ at 125â"high, but "merely respectable" according to biographer James Gleick; When he turned 15, he taught himself trigonometry, advanced algebra, infinite series, analytic geometry, and both differential and integral calculus. Before entering college, he was experimenting with and deriving mathematical topics such as the half-derivative using his own notation. In high school he was developing the mathematical intuition behind his Taylor series of mathematical operators. Feynman attended Far Rockaway High School, a school in Far Rockaway, Queens also attended by fellow laureates Burton Richter and Baruch Samuel Blumberg. A member of the Arista Honor Society, in his last year in high school Feynman won the New York University Math Championship; the large difference between his score and those of his closest competitors shocked the judges. He attained a perfect score on the graduate school entrance exams to Princeton University in mathematics and physicsâ"an unprecedented featâ"but did rather poorly on the history and English portions. Attendees at Feynman's first seminar included Albert Einstein, Wolfgang Pauli, and John von Neumann. He received a Ph.D. from Princeton in 1942; his thesis advisor was John Archibald Wheeler. Feynman's thesis applied the principle of stationary action to problems of quantum mechanics, inspired by a desire to quantize the Wheelerâ"Feynman absorber theory of electrodynamics, laying the groundwork for the "path integral" approach and Feynman diagrams, and was titled "The Principle of Least Action in Quantum Mechanics". This was Richard Feynman nearing the crest of his powers. At twenty-three ... there was no physicist on earth who could match his exuberant command over the native materials of theoretical science. It was not just a facility at mathematics (though it had become clear ... that the mathematical machinery emerging from the Wheelerâ"Feynman collaboration was beyond Wheeler's own ability). Feynman seemed to possess a frightening ease with the substance behind the equations, like Albert Einstein at the same age, like the Soviet physicist Lev Landauâ"but few others. At Princeton, the physicist Robert R. Wilson encouraged Feynman to participate in the Manhattan Projectâ"the wartime U.S. Army project at Los Alamos developing the atomic bomb. Feynman said he was persuaded to join this effort to build it before Nazi Germany developed their own bomb. He was assigned to Hans Bethe's theoretical division and impressed Bethe enough to be made a group leader. He and Bethe developed the Betheâ"Feynman formula for calculating the yield of a fission bomb, which built upon previous work by Robert Serber. Due to the top secret nature of the work, Los Alamos was isolated. In Feynman's own words, "There wasn't anything to do there." Bored, he indulged his curiosity by learning to pick the combination locks on cabinets and desks used to secure papers. Feynman played many jokes on colleagues. In one case he found the combination to a locked filing cabinet by trying the numbers he thought a physicist would use (it proved to be 27â"18â"28 after the base of natural logarithms, e = 2.71828...), and found that the three filing cabinets where a colleague kept a set of atomic bomb research notes all had the same combination. He left a series of notes in the cabinets as a prank, which initially spooked his colleague, Frederic de Hoffmann, into thinking a spy or saboteur had gained access to atomic bomb secrets. On several occasions, Feynman drove to Albuquerque to see his ailing wife in a car borrowed from Klaus Fuchs, who was later discovered to be a real spy for the Soviets, transporting nuclear secrets in his car to Santa Fe. On occasion, Feynman would find an isolated section of the mesa where he could drum in the style of American natives; "and maybe I would dance and chant, a little". These antics did not go unnoticed, and rumors spread about a mysterious Indian drummer called "Injun Joe". He also became a friend of the laboratory head, J. Robert Oppenheimer, who unsuccessfully tried to court him away from his other commitments after the war to work at the University of California, Berkeley. Feynman alludes to his thoughts on the justification for getting involved in the Manhattan project in The Pleasure of Finding Things Out. He felt the possibility of Nazi Germany developing the bomb before the Allies was a compelling reason to help with its development for the U.S. He goes on to say, however, that it was an error on his part not to reconsider the situation once Germany was defeated. In the same publication, Feynman also talks about his worries in the atomic bomb age, feeling for some considerable time that there was a high risk that the bomb would be used again soon, so that it was pointless to build for the future. Later he describes this period as a "depression". Following the completion of his Ph.D. in 1942, Feynman held an appointment at the University of Wisconsinâ"Madison as an assistant professor of physics. The appointment was spent on leave for his involvement in the Manhattan project. In 1945, he received a letter from Dean Mark Ingraham of the College of Letters and Science requesting his return to UW to teach in the coming academic year. His appointment was not extended when he did not commit to return. In a talk given several years later at UW, Feynman quipped, "It's great to be back at the only university that ever had the good sense to fire me." After the war, Feynman declined an offer from the Institute for Advanced Study in Princeton, New Jersey, despite the presence there of such distinguished faculty members as Albert Einstein, Kurt GÃ¶del and John von Neumann. Feynman followed Hans Bethe, instead, to Cornell University, where Feynman taught theoretical physics from 1945 to 1950. During a temporary depression following the destruction of Hiroshima by the bomb produced by the Manhattan Project, he focused on complex physics problems, not for utility, but for self-satisfaction. One of these was analyzing the physics of a twirling, nutating dish as it is moving through the air. His work during this period, which used equations of rotation to express various spinning speeds, proved important to his Nobel Prizeâ"winning work, yet because he felt burned out and had turned his attention to less immediately practical problems, he was surprised by the offers of professorships from other renowned universities. Despite yet another offer from the Institute for Advanced Study, Feynman rejected the Institute on the grounds that there were no teaching duties: Feynman felt that students were a source of inspiration and teaching was a diversion during uncreative spells. Because of this, the Institute for Advanced Study and Princeton University jointly offered him a package whereby he could teach at the university and also be at the institute. Feynman instead accepted an offer from the California Institute of Technology (Caltech)â"and as he says in his book Surely You're Joking Mr. Feynman!â"because a desire to live in a mild climate had firmly fixed itself in his mind while he was installing tire chains on his car in the middle of a snowstorm in Ithaca. Feynman has been called the "Great Explainer". He gained a reputation for taking great care when giving explanations to his students and for making it a moral duty to make the topic accessible. His guiding principle was that, if a topic could not be explained in a freshman lecture, it was not yet fully understood. Feynman gained great pleasure from coming up with such a "freshman-level" explanation, for example, of the connection between spin and statistics. What he said was that groups of particles with spin Â½ "repel", whereas groups with integer spin "clump". This was a brilliantly simplified way of demonstrating how Fermiâ"Dirac statistics and Boseâ"Einstein statistics evolved as a consequence of studying how fermions and bosons behave under a rotation of 360Â°. This was also a question he pondered in his more advanced lectures, and to which he demonstrated the solution in the 1986 Dirac memorial lecture. In the same lecture, he further explained that antiparticles must exist, for if particles had only positive energies, they would not be restricted to a so-called "light cone". Quantum electrodynamics. The theory for which Feynman won his Nobel Prize is known for its accurate predictions. This theory was begun in the earlier years during Feynman's work at Princeton as a graduate student and continued while he was at Cornell. This work consisted of two distinct formulations, and it is a common error to confuse them or to merge them into one. The first is his path integral formulation (actually, Feynman couldn't formulate QED as a Feynman Integral since that involves super-Feynman Integrals, which were developed by others in the 1950s), and the second is the formulation of his Feynman diagrams. Both formulations contained his sum over histories method in which every possible path from one state to the next is considered, the final path being a sum over the possibilities (also referred to as sum-over-paths). For a number of years he lectured to students at Caltech on his path integral formulation of quantum theory. The second formulation of quantum electrodynamics (using Feynman diagrams) was specifically mentioned by the Nobel committee. The logical connection with the path integral formulation is interesting. Feynman did not prove that the rules for his diagrams followed mathematically from the path integral formulation. Some special cases were later proved by other people, but only in the real case, so the proofs don't work when spin is involved. The second formulation should be thought of as starting anew, but guided by the intuitive insight provided by the first formulation. Freeman Dyson published a paper in 1949, which, among many other things, added new rules to Feynman's that told how to actually implement renormalization. Students everywhere learned and used the powerful new tool that Feynman had created. Eventually computer programs were written to compute Feynman diagrams, providing a tool of unprecedented power. It is possible to write such programs because the Feynman diagrams constitute a formal language with a grammar. Marc Kac provided the formal proofs of the summation under history, showing that the parabolic partial differential equation can be reexpressed as a sum under different histories (that is, an expectation operator), what is now known as the Feynmanâ"Kac formula, the use of which extends beyond physics to many applications of stochastic processes. Physics of the superfluidity of supercooled liquid helium, where helium seems to display a complete lack of viscosity when flowing. Feynman provided a quantum-mechanical explanation for the Soviet physicist Lev D. Landau's theory of superfluidity. Applying the SchrÃ¶dinger equation to the question showed that the superfluid was displaying quantum mechanical behavior observable on a macroscopic scale. This helped with the problem of superconductivity; however, the solution eluded Feynman. It was solved with the BCS theory of superconductivity, proposed by John Bardeen, Leon Neil Cooper, and John Robert Schrieffer. He also developed Feynman diagrams, a bookkeeping device that helps in conceptualizing and calculating interactions between particles in spacetime, notably the interactions between electrons and their antimatter counterparts, positrons. This device allowed him, and later others, to approach time reversibility and other fundamental processes. Feynman's mental picture for these diagrams started with the hard sphere approximation, and the interactions could be thought of as collisions at first. It was not until decades later that physicists thought of analyzing the nodes of the Feynman diagrams more closely. Feynman famously painted Feynman diagrams on the exterior of his van. From his diagrams of a small number of particles interacting in spacetime, Feynman could then model all of physics in terms of the spins of those particles and the range of coupling of the fundamental forces. Feynman attempted an explanation of the strong interactions governing nucleons scattering called the parton model. The parton model emerged as a complement to the quark model developed by his Caltech colleague Murray Gell-Mann. The relationship between the two models was murky; Gell-Mann referred to Feynman's partons derisively as "put-ons". In the mid-1960s, physicists believed that quarks were just a bookkeeping device for symmetry numbers, not real particles, as the statistics of the Omega-minus particle, if it were interpreted as three identical strange quarks bound together, seemed impossible if quarks were real. The Stanford linear accelerator deep inelastic scattering experiments of the late 1960s showed, analogously to Ernest Rutherford's experiment of scattering alpha particles on gold nuclei in 1911, that nucleons (protons and neutrons) contained point-like particles that scattered electrons. It was natural to identify these with quarks, but Feynman's parton model attempted to interpret the experimental data in a way that did not introduce additional hypotheses. For example, the data showed that some 45% of the energy momentum was carried by electrically-neutral particles in the nucleon. These electrically-neutral particles are now seen to be the gluons that carry the forces between the quarks and carry also the three-valued color quantum number that solves the Omega-minus problem. Feynman did not dispute the quark model; for example, when the fifth quark was discovered in 1977, Feynman immediately pointed out to his students that the discovery implied the existence of a sixth quark, which was duly discovered in the decade after his death. After the success of quantum electrodynamics, Feynman turned to quantum gravity. By analogy with the photon, which has spin 1, he investigated the consequences of a free massless spin 2 field, and derived the Einstein field equation of general relativity, but little more. However, the computational device that Feynman discovered then for gravity, "ghosts", which are "particles" in the interior of his diagrams that have the "wrong" connection between spin and statistics, have proved invaluable in explaining the quantum particle behavior of the Yangâ"Mills theories, for example, QCD and the electro-weak theory. In 1965, Feynman was appointed a foreign member of the Royal Society. At this time in the early 1960s, Feynman exhausted himself by working on multiple major projects at the same time, including a request, while at Caltech, to "spruce up" the teaching of undergraduates. After three years devoted to the task, he produced a series of lectures that eventually became The Feynman Lectures on Physics. He wanted a picture of a drumhead sprinkled with powder to show the modes of vibration at the beginning of the book. Concerned over the connections to drugs and rock and roll that could be made from the image, the publishers changed the cover to plain red, though they included a picture of him playing drums in the foreword. The Feynman Lectures on Physics occupied two physicists, Robert B. Leighton and Matthew Sands, as part-time co-authors for several years. Even though the books were not adopted by most universities as textbooks, they continue to sell well because they provide a deep understanding of physics. As of 2005, The Feynman Lectures on Physics has sold over 1.5Â million copies in English, an estimated 1Â million copies in Russian, and an estimated half million copies in other languages. Many of his lectures and miscellaneous talks were turned into other books, including The Character of Physical Law, QED: The Strange Theory of Light and Matter, Statistical Mechanics, Lectures on Gravitation, and the Feynman Lectures on Computation. In 1974, Feynman delivered the Caltech commencement address on the topic of cargo cult science, which has the semblance of science, but is only pseudoscience due to a lack of "a kind of scientific integrity, a principle of scientific thought that corresponds to a kind of utter honesty" on the part of the scientist. He instructed the graduating class that "The first principle is that you must not fool yourselfâ"and you are the easiest person to fool. So you have to be very careful about that. After you've not fooled yourself, it's easy not to fool other scientists. You just have to be honest in a conventional way after that." In 1984â"86, he developed a variational method for the approximate calculation of path integrals, which has led to a powerful method of converting divergent perturbation expansions into convergent strong-coupling expansions (variational perturbation theory) and, as a consequence, to the most accurate determination of critical exponents measured in satellite experiments. Feynman diagrams are now fundamental for string theory and M-theory, and have even been extended topologically. The world-lines of the diagrams have developed to become tubes to allow better modeling of more complicated objects such as strings and membranes. Shortly before his death, Feynman criticized string theory in an interview: "I don't like that they're not calculating anything," he said. "I don't like that they don't check their ideas. I don't like that for anything that disagrees with an experiment, they cook up an explanationâ"a fix-up to say, 'Well, it still might be true.'" These words have since been much-quoted by opponents of the string-theoretic direction for particle physics. While researching for his Ph.D., Feynman married his first wife, Arline Greenbaum (often misspelled Arlene). They married knowing that Arline was seriously ill from tuberculosis, of which she died in 1945. In 1946, Feynman wrote a letter to her, but kept it sealed for the rest of his life. This portion of Feynman's life was portrayed in the 1996 film Infinity, which featured Feynman's daughter, Michelle, in a cameo role. He later married Gweneth Howarth (1934â"1989) from Ripponden, Yorkshire, who shared his enthusiasm for life and spirited adventure. Besides their home in Altadena, California, they had a beach house in Baja California, purchased with the prize money from Feynman's Nobel Prize, his one third share of $55,000. They remained married until Feynman's death. They had a son, Carl, in 1962, and adopted a daughter, Michelle, in 1968. Feynman had a great deal of success teaching Carl, using, for example, discussions about ants and Martians as a device for gaining perspective on problems and issues. He was surprised to learn that the same teaching devices were not useful with Michelle. Mathematics was a common interest for father and son; they both entered the computer field as consultants and were involved in advancing a new method of using multiple computers to solve complex problemsâ"later known as parallel computing. The Jet Propulsion Laboratory retained Feynman as a computational consultant during critical missions. One co-worker characterized Feynman as akin to Don Quixote at his desk, rather than at a computer workstation, ready to do battle with the windmills. Feynman traveled widely, notably to Brazil, where he gave courses at the CBPF (Brazilian Center for Physics Research) and near the end of his life schemed to visit the Russian land of Tuva, a dream that, because of Cold War bureaucratic problems, never became reality. The day after he died, a letter arrived for him from the Soviet government, giving him authorization to travel to Tuva. Out of his enthusiastic interest in reaching Tuva came the phrase "Tuva or Bust" (also the title of a book about his efforts to get there), which was tossed about frequently amongst his circle of friends in hope that they, one day, could see it firsthand. The documentary movie, Genghis Blues, mentions some of his attempts to communicate with Tuva and chronicles the successful journey there by his friends. Responding to Hubert Humphrey's congratulation for his Nobel Prize, Feynman admitted to a long admiration for the then vice president. In a letter to an MIT professor dated December 6, 1966, Feynman expressed interest in running for governor of California. According to Genius, the James Gleick-authored biography, Feynman tried LSD during his professorship at Caltech. Somewhat embarrassed by his actions, he largely sidestepped the issue when dictating his anecdotes; he mentions it in passing in the "O Americano, Outra Vez" section, while the "Altered States" chapter in Surely You're Joking, Mr. Feynman! describes only marijuana and ketamine experiences at John Lilly's famed sensory deprivation tanks, as a way of studying consciousness. Feynman gave up alcohol when he began to show vague, early signs of alcoholism, as he did not want to do anything that could damage his brainâ"the same reason given in "O Americano, Outra Vez" for his reluctance to experiment with LSD. Feynman had two rare forms of cancer, liposarcoma and WaldenstrÃ¶m's macroglobulinemia, dying shortly after a final attempt at surgery for the former on February 15, 1988, aged 69. His last recorded words are noted as, "I'd hate to die twice. It's so boring." Actor Alan Alda commissioned playwright Peter Parnell to write a two-character play about a fictional day in the life of Feynman set two years before Feynman's death. The play, QED, which was based on writings about Richard Feynman's life during the 1990s, premiered at the Mark Taper Forum in Los Angeles, California in 2001. The play was then presented at the Vivian Beaumont Theater on Broadway, with both presentations starring Alda as Richard Feynman. The principal character in Thomas A. McMahon's 1970 novel, Principles of American Nuclear Chemistry: A Novel, is modeled on Feynman. In February 2008 LA Theatre Works released a recording of 'Moving Bodies' with Alfred Molina in the role of Richard Feynman. This radio play written by playwright Arthur Giron is an interpretation on how Feynman became one of the iconic American scientists and is loosely based on material found in Feynman's two transcribed oral memoirs Surely You're Joking, Mr. Feynman! and What Do You Care What Other People Think?. On the twentieth anniversary of Feynman's death, composer Edward Manukyan dedicated a piece for solo clarinet to his memory. It was premiered by Doug Storey, the principal clarinetist of the Amarillo Symphony. 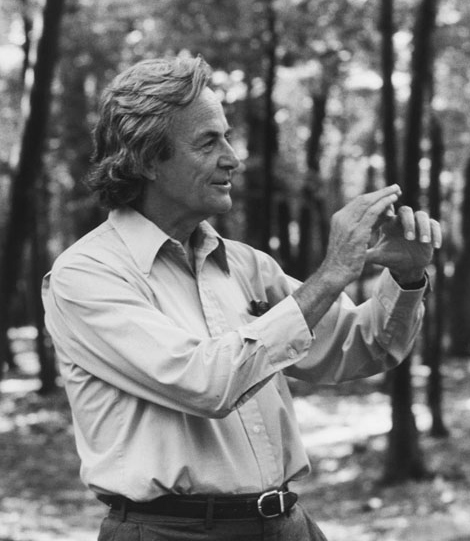 Between 2009 and 2011, clips of an interview with Feynman were used by composer John Boswell as part of the Symphony of Science project in the second, fifth, seventh, and eleventh installments of his videos, "We Are All Connected", "The Poetry of Reality", "A Wave of Reason", and "The Quantum World". The Feynman Lectures on Physics is perhaps his most accessible work for anyone with an interest in physics, compiled from lectures to Caltech undergraduates in 1961â"64. As news of the lectures' lucidity grew, a number of professional physicists and graduate students began to drop in to listen. Co-authors Robert B. Leighton and Matthew Sands, colleagues of Feynman, edited and illustrated them into book form. The work has endured and is useful to this day. They were edited and supplemented in 2005 with "Feynman's Tips on Physics: A Problem-Solving Supplement to the Feynman Lectures on Physics" by Michael Gottlieb and Ralph Leighton (Robert Leighton's son), with support from Kip Thorne and other physicists. Feynman, Richard P.; Leighton, Robert B.; Sands, Matthew (2005). The Feynman Lectures on Physics: The Definitive and Extended Edition (2nd ed.). Addison Wesley. ISBNÂ 0-8053-9045-6.Â Includes Feynman's Tips on Physics (with Michael Gottlieb and Ralph Leighton), which includes four previously unreleased lectures on problem solving, exercises by Robert Leighton and Rochus Vogt, and a historical essay by Matthew Sands. Three volumes; originally published as separate volumes in 1964 and 1966. Samples of Feynman's drumming, chanting and speech are included in the songs "Tuva Groove (Bolur Daa-Bol, Bolbas Daa-Bol)" and "Kargyraa Rap (DÃ¼rgen Chugaa)" on the album Back Tuva Future, The Adventure Continues by Kongar-ool Ondar. The hidden track on this album also includes excerpts from lectures without musical background. Ottaviani, Jim and Myrick, Leland (2011) Feynman. First Second. ISBN 978-1-59643-259-8 OCLCÂ 664838951. "The Pleasure of Finding Things Out" on YouTube. Feynman talks about his life in science and his love of exploring nature. 1981, BBC Horizon. See Christopher Sykes Productions. "The Quest for Tannu Tuva" on YouTube, with Richard Feynman and Ralph Leighton. 1987, BBC Horizon and PBS Nova (entitled "Last Journey of a Genius"). The Challenger (2013) A BBC Two factual drama starring William Hurt, tells the story of American Nobel prize-winning physicist Richard Feynmanâs determination to reveal the truth behind the 1986 space shuttle Challenger disaster.